The ground fault protection is achieved using earth leakage circuit breaker (ELCB). When the fault current or leakage current flows through earth return path then it form the earth fault. These faults are relatively frequent and hence protection is required against these which is provided with the help of earth leakage circuit breaker. Consider an example of a person whose finger sticks into the socket. Even though the metal enclosure is securely earthened, the person will receive a sever shock. Under such case these must be certain device that will cut the supply. This can be done with the help of ELCB which will typically trip in around 25 ms if current exceeds its preset value. The schematic of ELCB is shown in Fig. 1. As shown in the Fig. 1 ELCB consists of a small current transformer surrounding live and natural wire. The secondary winding of current transformer is connected to relay circuit which can trip the circuit breaker which is connected in the circuit. Under normal conditions, the current in line and neutral conductor is same so that net current (IL -IN) flowing through the core is zero. Eventually there will not be any production of flux in the core and no induced emf. So the breaker does not trip. If there is a fault due to leakage from live wire to earth or a person by mistake touching to the live terminal then the net current through the core will no longer remain as zero but equal to IL -IN or If which will set up flux and emf in C.T. As per the preset value the unbalance in current is detected by C.T. 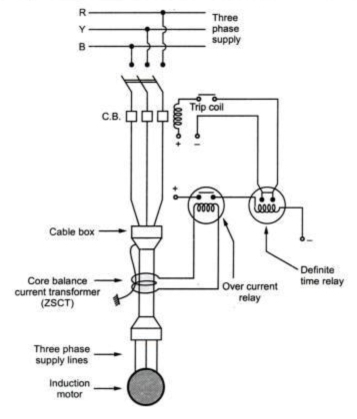 and relay coil is energized which will give tripping signal for the circuit breaker. As C.T. operates with low value of current, the core must be very permeable at low flux densities. 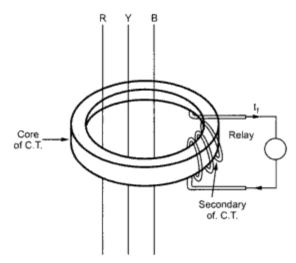 In case of three phase circuits, single ring shaped core of magnetic material, encircles the conductor of all three phases as shown in the Fig. 2. A secondary is connected to relay circuit. Under normal condition, the component of fluxes due to field of three conductors are balanced and secondary carries negligible current. During faulty condition, the balance is distributed and current is induced in the secondary to trip the circuit breaker through relay. This method to provide earth fault protection is called core balance type protection or zero sequence current transformer (ZSCT) protection. In case of earth faults, to avoid burning of coils and stampings the motor must be disconnected as quickly as possible from the supply. The Fig 3 shows ZSCT protection scheme. It is preferred for the systems with neutral earthed via resistance.